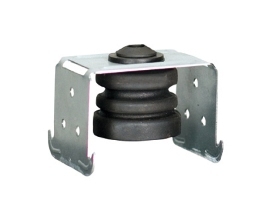 Vibro-mini can be combined with a suitable reinforced and modulated galvanized metal suspension hanger, offering vibration isolation on sound insulation gypsumboard ceilings. 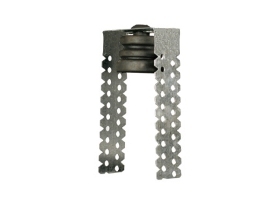 The hole of the rubberof the Vibro-mini, is Φ8 mm for the pass-through bolt. 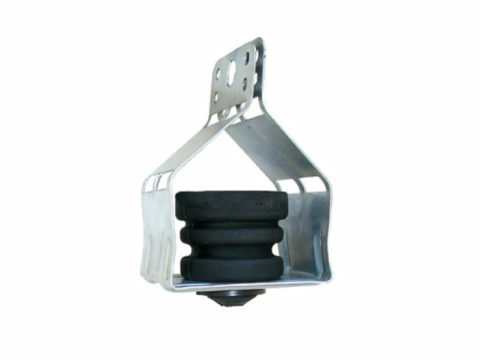 A long threaded rod could be used in order to adjust the height of the false ceiling. 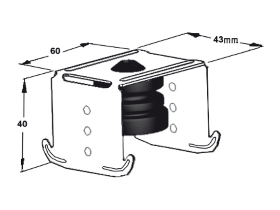 The suspension hanger has grabbling edges for quick and easy connection with the standard ceiling profiles 60 x 27mm, according to DIN 18182-1. These edges help the adaptation with standard metal profile of the false ceilings so that it can be easily handled. Therefore, the working cost is decreased and it also facilitates the work of the installer. Natural frequency achieved : 15Hz. Note: The anchor of suspension must be perpendicular.